Rebels Review: "Shroud of Darkness"
Star Wars Rebels hit it out of the park this week, with "Shroud of Darkness" being one of the best episodes of the series. 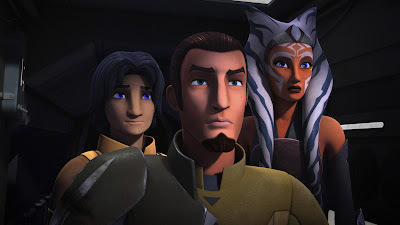 This installment featured Kanan and Ezra returning to the Jedi Temple on Lothal with Ahsoka to discover new secrets about their enemies, the Force, and themselves. With a balance of new insight about the Force, great action, and a slew of guest stars, we were treated to a nearly perfect episode. The meat of this week’s story was split into three main segments, Kanan's confrontation with a Jedi Temple guard with a familiar face, Ezra's conversation with Yoda, and Ahsoka finally accepting the truth about her former master. Each segment offered wonderful insight into the characters and their journeys while not diminishing the significance of the others. Kanan's vision in this episode saw him face off with a Force vision of a Jedi Temple guard, who was later revealed to be the Grand Inquisitor from Season One (more on that in a moment). It was fascinating to see Kanan's lesson was something that Anakin never learned--to let go. Kanan accepts in that moment that he can never control Ezra's destiny and that he can only do his best to guide him in the right direction. It's a simple lesson, but a crucial one. Kanan’s acceptance of Ezra as his apprentice was a key moment in his life, as it brought him back to the Jedi path. Anakin's greatest weakness was refusing to let go, and his fear of losing those around him is what drove him to the Dark Side (which, ironically, cost him everyone he cared about). The Grand Inquisitor makes it clear to Kanan the danger Ezra faces and it is only in Kanan's acceptance that Ezra must be allowed to confront this threat and overcome it on his own that he is granted the rank of Jedi Knight. Having the Force vision take the form of the Grand Inquisitor was a nice touch by the Rebels crew. It demonstrates the impact this character had on Kanan. The Grand Inquisitor represents all of Kanan's worst fears for Ezra. In his role as Temple Guard during the Clone Wars, the Grand Inquisitor was at a similar point: he was on the Light Side path but had the potential to go Dark, and did. Ezra has touched the Dark Side before, back in Season One's "Gathering Forces", so we know he has the potential to follow that path. It also interesting to see Kanan have such an important moment in his life, changing the way he sees the galaxy, so close to Zeb also having had a similar experience in "Legends of the Lasat". It seems to me that the series is beginning to shift its focus more onto the younger characters, Ezra and Sabine, who still have lots of room to grow and develop. Hera has always served as the rock for the crew of The Ghost and now with Zeb and Kanan both finding an inner peace they haven't had before, the focus can now shift to the next generation. Unlike Kanan, Zeb, and Hera, Ezra and Sabine never knew life before the Empire (Sabine was likely a toddler when the Empire rose and Ezra was born the same day as the Empire). Hopefully we get to see them grow into leadership roles within the Rebellion and see how their views are both shaped by and differ from those of the previous generation. The big difference between Ezra’s conversation with Yoda this week and their conversation in Season One is that Ezra is now powerful enough in the Force to actually see Yoda. It's always fascinating to see Yoda in this era, but Ezra’s search for the power to defeat his enemies made it especially poignant. Yoda has given up the warrior ways we saw in the prequels and has embraced the teachings of Qui-Gon Jinn and the Force Priestesses (as seen in Season Six of The Clone Wars). His message to Ezra was not dissimilar to what the Grand Inquisitor told Kanan. "How Jedi choose to win, the question is," Yoda tells Ezra. Yoda’s message to Ezra is to not act out of fear. Yoda admits that not only did he himself act out of fear for most his life, but also the Jedi Order as a whole. Fear is the path to the Dark Side, and Yoda has seen the result first hand: his message to Ezra is that he cannot fall into this trap. And finally, there was the moment we've all been waiting for, when Ahsoka Tano finally accepts the truth that Anakin Skywalker had become Darth Vader. It is my belief that Ahsoka knew who Vader was the second they connected through the Force in "The Siege of Lothal". Vader knew right away who he was communing with, so why wouldn't Ahsoka? She didn't want to believe that Anakin could have become a Sith lord. We know how Padme reacted in Revenge of the Sith when she was told what Anakin had done. She refused to believe it and went out to find answers for herself. Ahsoka did the same thing, hoping to find that she was wrong. Sadly, as we saw in this episode, she was forced to accept the most horrible truth. Her vision of Anakin Skywalker was a compelling one, giving us insight into her deepest fears. Anakin blames Ahsoka’s having left the Jedi order for his fall to the Dark Side, accusing her of not being there for him when he needed her. We see that Ahsoka still has doubts about her decision to leave the Jedi Order, believing that perhaps she could have helped him avoid his fate. Her reaction to the vision, when she breaks down, shows just how powerful a truth this was to her. Though Ahsoka is not to be blamed for what happened to Anakin, it's clear that she does hold herself responsible. The fact that Ahsoka did get to commune, however briefly, with Yoda should offer her some comfort. Though not a word was spoken, Yoda communicated to Ahsoka that she is still on the right path, the Jedi path. When Ahsoka left the Order, she rejected the Order itself, not the Jedi way. It is clear from what we have seen from her on Rebels that she still upholds the ideals and beliefs of the Jedi, while operating outside the bureaucracy that led to the Order's downfall. Yoda's encouragement, should (hopefully) help her uphold those beliefs when her worst nightmare comes true and she is forced to confront her fallen Master. The opening of this episode, dropping us in in the middle of the lightsaber duel between Kanan, Ezra, the Fifth Brother, and the Seventh Sister, felt like classic Star Wars. The Inquisitors were an effective threat this week, as they put the pressure on our heroes to get the information they needed from the Jedi Temple and get out, giving this episode a sense of urgency that has been somewhat lacking this season. It would have been nice to see more of them prior to this episode. We're told they have been chasing the Rebels around the outer rim, but we really haven't seen much evidence of that. This was only the Inquisitors’ fourth appearance this season, and we could have benefited from at least one more showdown before this episode. That being said, it looks like the Inquisitors will play a big role in the rest of the season, in which case any more might have wound up feeling like overkill. A couple of quick other thoughts about "Shroud of Darkness". It was interesting to see footage from Attack of the Clones included in Yoda's Force vision to Ezra. This was the first time we saw live action and animated Star Wars crossover in this way. I also want to take a moment to marvel at the guest stars on this week's episode, which saw Frank Oz and James Earl Jones reprising their roles as Yoda and Darth Vader from the films, The Clone Wars stars Matt Lanter and Ashley Eckstein back as Anakin and Ahsoka, Buffy star Sarah Michelle Gellar back as the Seventh Sister, and Jason Isaacs back as The Grand Inquisitor! And finally, it's worth noting that the planet Yoda mentions to Ezra, Malachor, is also mentioned on page 27 of the The Force Awakens: The Visual Dictionary in connection with Kylo Ren. Apparently, the design Kylo's lightsaber dates back to the "Great Scourge of Malachor", which took place thousands of years before the films. I guess that explains the shot in the trailer of Ezra holding a green version of Kylo's saber! Overall, "Shroud of Darkness" is one of the best episodes yet of Star Wars Rebels, up there with the likes of "Fire Across the Galaxy" and "The Siege of Lothal". “Shroud of Darkness” not only advanced the story of the series, but also explored big issues related to the saga as a whole. The pacing in this episode was just about perfect, and every moment was given the weight and importance it deserved. This was the best episode of Rebels yet. "It was interesting to see footage from Attack of the Clones included in Yoda's Force vision to Ezra. This was the first time we saw live action and animated Star Wars crossover in this way." Are you sure? Now, I am honestly just using my memory of the episode (and I saw it nearly 24 hours ago), but I could swear it looked more like a recreation of Attack of the Clones than actual footage (the helmets looked like The Clone Wars-style helmets than ATOC). I could be wrong. I definitely know I could be wrong since I am at a severe disadvantage: no matter if it was a recreation or footage from Episode II, it would still be CG. Either way, it was a cool moment. I fully agree with your sentiment Dominic, an excellent episode. I would also add that I find more plausible that the Knights of Ren are closely linked to the Jedi temple guards or at least inspired by them. I'm sure this will be unraveled in episode 8. Great episode, but Yoda was designed poorly. He looked like Bob Newhart. I'm not expecting Disney's animators to match "Clone Wars", but they totally failed in their research and representation of him.